I took the plunge and made simple tie-back curtains. They don't quite meet my ideal, but they're not bad and it definitely adds to the room's cheerfulness! There was only so much of the print (a Jo-Ann exclusive that I bought off of Etsy), and though I'd have liked to make them quite a bit longer, I did the best I could with what I had. I still need to make some pull-backs. Right now I'm using a couple strands of super-neon orange yarn! Hubby's first comment was, "Do you have any more of that green so you can make a valance to cover up the top?" Geez...way to boost a body's confidence! (The answer, by the way, is no. I used every inch I could squeeze out of both fabrics). 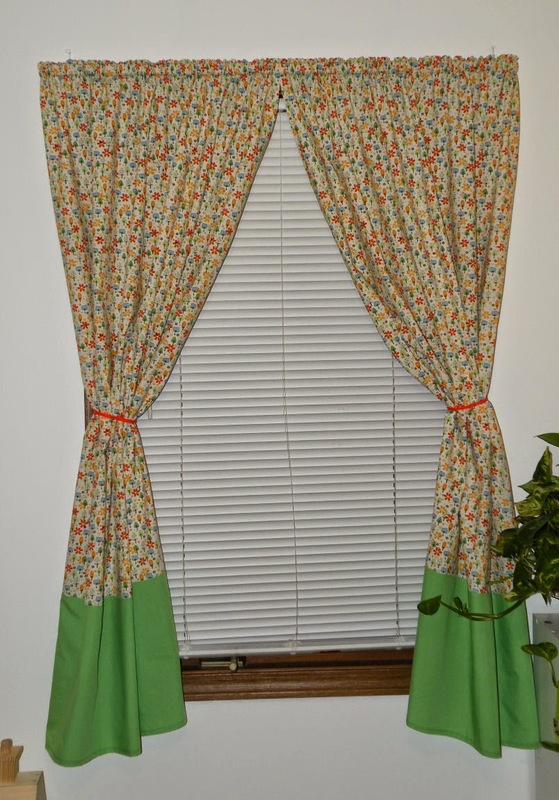 Maybe some day I'll get a decorative curtain rod and hang them straight (not tied back) on the sides of the window. But this'll do quite nicely for now. I think the curtains look lovely. I like the green at the bottom. They also look gender neutral so your son should like them too. :o) I think your room is coming together quite nicely. I need to get the drive to finish my own bedroom. I have a partially painted brown wall in my bedroom that has been there for about six months! LOL!